Category: SARMs Tag: Musclegen Research Brand: Medfit RX. This extreme mass-building stack isn’t for the lifting newbie. 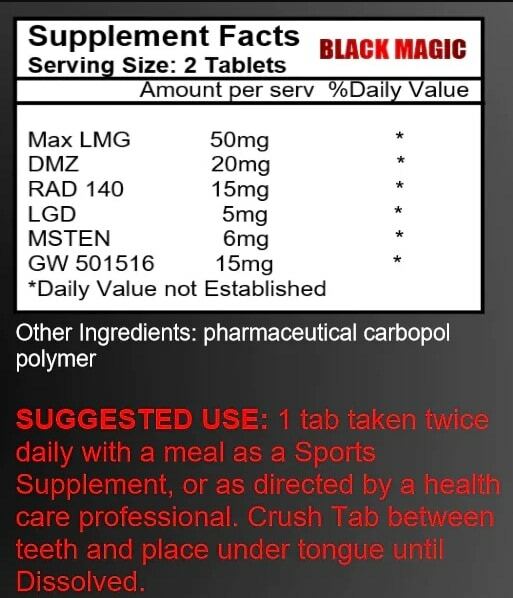 With some of the best SARMS and pro-hormones in the industry distilled into one powerful pill, Black Magic helps the obsessed gym freak to unleash the black beast inside him that is hungry for MASS. The ultimate stack for the champion who wants to destroy his competition and explode his natural barriers to gain maximum mass in a short amount of time. 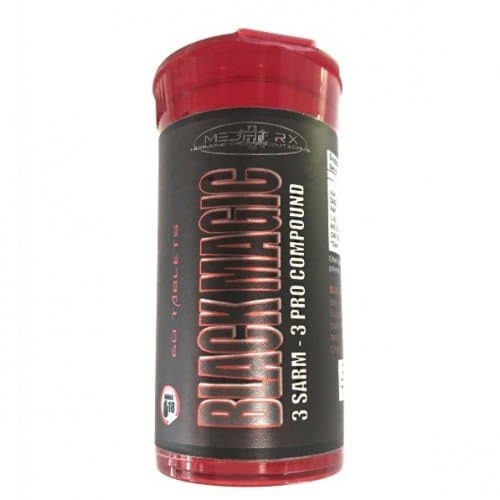 Black Magic is forged from 3 SARMS and 3 Pro-Hormone compounds that are designed to give you the power to push through your limits and feed that dark beast waiting for more mass. MaxLMG (13-Ethyl-3-Methoxy-Gona-2,5(10)-Diene-17-One) is an anti-progesterone which gives you impressive gains in muscle mass and hardness while reducing water retention. Max LMG is very popular as a stacking compound and is usually used along with prohormones like Superdrol and Halodrol. Dymethazine (DMZ) is a highly effective and versatile compound that is known for providing massive lean muscle and strength gains, zero water retention, and increased vascularity. The prohormone Dymethazine (DMZ) is one of the top choices of users looking to add muscle mass while leaning out. LGD-4033 was developed with the goal in mind to promote healing properties in the body. Namely, it was mean to prevent muscle-wasting as well as stimulating positive activity in bones and muscles. LGD-4033 aids in preventing muscle breakdown between workouts by being anti-catabolic. It also delivers power behind movement and increases stamina levels as well. MST (MethylStenbolone) is a potent methylated prohormone that does not convert to an estrogenic metabolite or have any affinity for the progesterone receptor. This means estrogen side effects are virtually non-existent. MST provides exceptional lean body mass gains, excellent strength gains, and great endurance in the gym. RAD140 (Testolone) is considered as the newest and most effective SARM out in the healthy body-building community. It has been highly regarded due to its numerous anabolic benefits that come with steroids, but without the damage on the human body. RAD140 is being used as a compound for cutting, strength, endurance and bulking. GW-501516 (Cardarine) is a unique type of SARM that increases gene expression and allows the body to expend energy even when it is at rest. It’s not an Anabolic steroid, but it can mimic the effect of exercise and amplify recovery, priming your body for better lifts in a record amount of time. Cardarine boosts your energy levels, so that you can smash the gym and work at a higher intensity for longer durations. It also reduces recovery time post training which means that there is less time in between training sessions. Most importantly, it strips unwanted body fat without the loss of your hard earned gains. MedFit Rx Pharmaceuticals does not represent its products as nutritional supplements and you as the customer acknowledge this when purchasing these products. You also acknowledge that when purchasing MedFit Rx products that you are at least 18 years of age. We highly recommend you consult a healthcare professional before starting any exercise or supplement program.